It has been shown that companies focused on Innovation are more profitable, and better prepared for future challenges. At the same time, it is estimated that less than 3% of board members have direct experience in Marketing or Innovation. Based on these facts I’m building a new course called “Innovation for CEOs and CFOs” for the Chicago Booth Business School. On April 18, I will be doing a conference in Chicago. At the event, I will explain the content of the course and work with people on developing new ideas. This event in Gent is a “dry-run” for this conference. This means it will be an interactive workshop, not simply a lecture. Participants will do some work in groups and I will ask for your advice/suggestions. This will be an interactive event and should be fun. 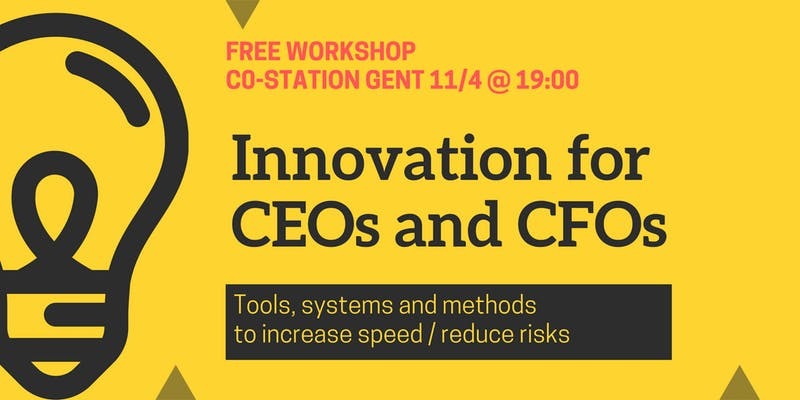 In exchange for your time, you’ll learn about tools, systems, and methods to make innovation faster, more profitable while reducing risks. You’ll also get an insight into what a top business school might include in a top 3-day course being sold for $7500.